Published October 7, 2004 in Dressage Daily. 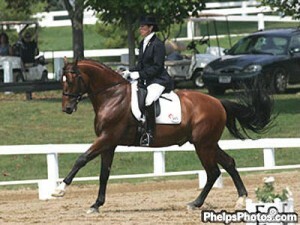 If there were a Sportsmanship Award for the USEF/Markel Young Horse Dressage National Championships, it would be won hands down by Deborah Hausman, who traveled to the Kentucky Horse Park from Oregon to compete with her talented Dutch Warmblood stallion Caletino (by Caretino-N.Anuberth 5 by Caletto). Bred in the Netherlands by Stal Roelofs, the two-year-old stallion was purchased at auction. Their business partner (of Nassau) seated at their table waved to a colleague across the room, and the auctioneer took the action for a bid. Click here for the entire article from Dressage Daily.